FILE - Monseigneur Marcel Utembi, a Catholic church mediator arrives for a meeting in Kinshasa, Democratic Republic of Congo, Wednesday, Dec. 21, 2016. In the Democratic Republic of Congo, members of the presidential alliance and the country’s main opposition coalition met again Thursday to try to hammer out a deal on delayed elections. Mediators from the Catholic Church say the two sides need to reach an agreement before Christmas, but so far neither side is showing signs of compromise. The Archbishop of Kisangani, Monseigneur Marcel Utembi, took a firm line as he reopened the talks in Kinshasa. Utembi said the church mediators are not inclined to look favorably on further undue postponements and delaying tactics. He expressed the church’s firm wish that a compromise be found before Christmas. Utembi is the president of CENCO, the organization that represents the Congolese Catholic Church, which is mediating the dispute over delayed elections. The talks were suspended Saturday while a delegation of Congolese archbishops visited the pope to seek guidance on the crisis. 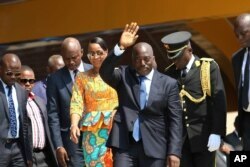 During the break, at midnight Monday, DRC President Joseph Kabila's elected mandate expired. He intends to remain in office until polls can be held. The leader of the Rassemblement, the country’s main opposition coalition, Etienne Tshisekedi, responded by declaring Kabila "illegitimate" and calling the population to "peaceful resistance." Security forces, heavily deployed since last week, put down sporadic demonstrations that started early Tuesday and continued into Wednesday in Kinshasa and other Congolese cities. Human Rights Watch says security forces have killed 34 people and it is still verifying additional reports. The police have given a lower toll. A spokesman told reporters Wednesday that 21 civilians have been killed, most by stray bullets or while engaged in looting. The police said one of their officers was also killed. But the Rassemblement has returned to the negotiating table. The secretary general of Tshisekedi’s party, Jean-Marc Kabund, spoke to journalists as the talks resumed. FILE - Democratic Republic of Congo President Joseph Kabila, center, waves as he and others celebrate the DRC's independence day, in Kindu, DRC, June 30, 2016. The Rassemblement boycotted talks earlier this year that provisionally set the presidential election for April 2018. The electoral commission says it needs time to prepare an updated voter roll. Kabila has so far refused to agree to the Rassemblement’s demand he publicly commit to not seeking a third term, which is forbidden by the Constitution. The coordinator of the youth activism group the Fourth Way, Jean-Marie Kalonji, does not see the point of further dialogue. Kalonji told VOA that CENCO must explain to the people why the negotiations are continuing because the people of the DRC are turning the page and Kabila is no longer president. He says the dialogue does not make any sense and that is why the Congolese youth protested on December 19th without the opposition calling for it. Tensions do not look to be abating any time soon. A police spokesman said that the enhanced security presence will remain in place until the end of the year.